[146 Pages Report] The global fertilizer additives market is projected to grow from USD 2.6 billion in 2016 to USD 2.9 billion by 2021, at a CAGR of 3.1% during the forecast period. Fertilizer additives offer several advantages, such as it helps to stimulate the productivity of fertilizers. In addition, the growing need for primary nutrients and high quality of fertilizers have also led to a surge in demand for increasing agricultural yields. These factors are driving the demand for fertilizer additives across regions. The base year considered for the study is 2015, and the forecast has been provided for the period between 2016 and 2021. Fertilizer additives are applied to various forms of fertilizers and ensure accurate application of fertilizers on the land. Depending on the manufacturing process, the particles of mineral fertilizers can be of various sizes and shapes, which include granules, pellets, ‘prills,’ crystals, and fine powder (dust). Most of the fertilizer additives are combined into granular fertilizers as compared to the other forms of application. The use of fertilizer additives during farming also helps the grower maintain the quality of produce. The combination of fertilizer additive and fertilizers helps in improving and increasing the yield. For instance, granular or dry fertilizers are available in the dry pelleted form, unlike spikes, liquid, and powder fertilizers. The main advantage of using granular fertilizers is that they are similar to time-release capsules, allowing nutrients to flow out over time, instead of flooding the plants with nutrients, as liquid fertilizers. During this research study, major players operating in the fertilizer additives market in various regions were identified, and their offerings, regional presence, and distribution channels were analyzed through in-depth discussions. Top-down and bottom-up approaches were used to determine the overall market size. Sizes of the other individual markets were estimated using the percentage splits obtained through secondary sources such as Hoovers, Bloomberg BusinessWeek, and Factiva along with primary respondents. The entire procedure includes the study of the annual and financial reports of the top market players and extensive interviews with industry experts such as CEOs, VPs, directors, and marketing executives for key insights (both qualitative and quantitative) pertaining to the market. The figure below shows the breakdown of the primaries on the basis of the company type, designation, and region considered during the research study. 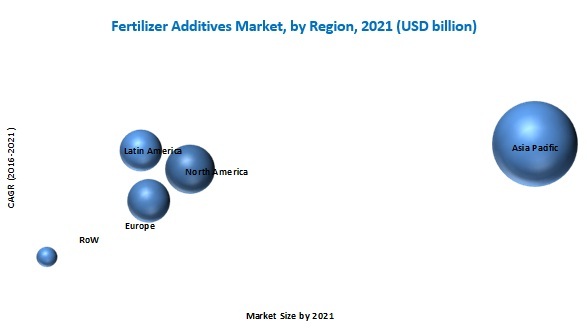 The fertilizer additives market comprises a network of players involved in the research and product development, raw material supply, component manufacturing, distribution and sale, and post-sales services. 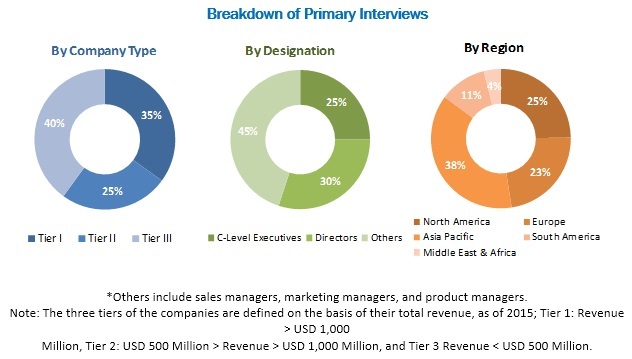 Key players considered in the analysis of the fertilizer additives market are Clariant Mining Solutions (Switzerland), KAO Corporation (Japan), Novochem Group (Netherlands), and ArrMaz (US). Other players such as Filtra Catalysts & Chemicals Ltd. (India), Amit Trading LTD. (Israel), Chemipol (Spain), Michelman (US), Tolsa Group (Spain), and Forbon Technology (China). In April 2016, Clariant Mining Solutions set up additional production capacity for Phosphate Esters (P-Esters) at its plant in Gendorf, Germany, to extend its existing production capacity at its Knapsack facility. Phosphate Esters (PEsters) were used as emulsifiers, wetting and dispersing agents, antistatic agents, and as additives for fertilizers. In January 2016, Filtra Catalysts and Chemicals Ltd became a subsidiary of Dorf Ketal Chemicals. The acquisition helped Dorf Ketal Chemicals to expand its operations in India for adsorbents and catalysts for downstream hydrocarbon industries such as oil refineries, petrochemicals, and fertilizer plants. In November 2015, ArrMaz opened its new chemical manufacturing plant located at AL Jalamid in Saudi Arabia. The AL Jalamid plant produces a full range of custom formulated process aids, additives for the processing of phosphate ore, and the production of phosphate fertilizers to support the growth of the Saudi phosphate industry. What are new types of fertilizer additives, which the fertilizer companies are exploring? The global fertilizer additives market is projected to grow from USD 2.6 billion in 2016 to USD 2.9 billion by 2021, at a CAGR of 2.6% during the forecast period. The demand for fertilizer additives is mainly dependent on the growth of the fertilizer industry. Further, the shrinking arable land, adoption of new technology in fertilizer production, and the increasing willingness of farmers to spend more for increased productivity are some important factors that contribute to the growing demand for fertilizer additives. Fertilizer additives are substances that enhance the quality and integrity of fertilizers. These are particularly engineered and developed to counter problems such as foaming, dedusting, moisture, and caking. Additives are effective tools for producers to improve the quality and integrity of their products and to reduce the damage caused during storage, transportation, and application. 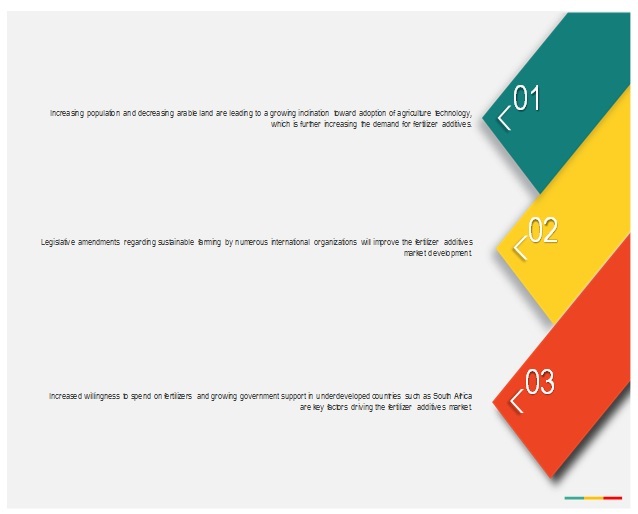 The fertilizer additives market is segmented on the basis of function, into anticaking agent, dedusting agent, antifoam agent, hydrophobic agent, and corrosion inhibitors. The market for anticaking agent is projected to grow at the highest CAGR between 2016 and 2021. Among all fertilizer additives, the anticaking agent is the most common fertilizer additive. The consumption of fertilizer additive as an anticaking agent is growing rapidly as caking, or clumping is a major concern in dry fertilizer production, storage, transport, and application. Thus, anti-caking agents are essential for the growth of various agriculture products. The fertilizer additives market in APAC is projected to grow at the highest CAGR during the forecast period. The increasing population and the increasing need to provide food to the growing population in the region continues to pose a major challenge, as arable land is limited and per capita arable land is decreasing in most of the Asian countries. This also encourages the application of fertilizer additives. Moreover, increasing farm expenditure has led to the increased market growth of fertilizer additives in this region. Urea has the highest nitrogen content as compared to all solid fertilizers. It is a widely used source of fertilizer nitrogen globally. The critical relative humidity of urea is high compared to the ammonium nitrate and calcium ammonium nitrate (CAN). Due to this, it can withstand hot and humid climate conditions. Generally, granular urea has enhanced handling properties compared to prilled urea. Granular urea is resistant to degradation and crushing. Up to 0.3% moisture content of urea is ideal to avoid problems such as caking. Moisture content above 0.3% results in the deterioration of urea during storage. Ammonium nitrate is the most widely used source of fertilizer nitrogen. Half of the nitrogen present in ammonium nitrate is in the ammoniacal form and half in the nitrate form. Granular ammonium nitrate has enhanced handling properties and is resistant to degradation and crushing. However, prilled ammonium nitrate is prone to considerable degradation and particle crushing when overused. Diammonium phosphate (DAP) is a granular fertilizer, which is a widely used source of phosphorus in the world. It has enhanced handling properties and is fairly resistant to degradation and crushing particles during handling. The moisture content of DAP varies between 1% and 2% depending on its source material. Less caking and other physical problems were observed while storing DAP due to low moisture level. What are the upcoming types of fertilizer additives? The growth of the organic fertilizers industry is a major factor restraining the market growth. The increasing awareness about health and wellness, the growing organic food industry, and significant increase in the cost of chemicals are factors that are fueling the growth of the global biofertilizers market. In addition, the affordable cost of biofertilizers, increasing focus on sustainable farming, rising government support, and environmental regulations are driving the biofertilizers market globally. Biofertilizers witnesses a significant demand attributed to its properties such as integrated nutrient management, cost-effectiveness, and renewable sources of plant nutrients to supplement chemical fertilizers for sustainable agriculture. Organic fertilizers are environment-friendly and do not have an adverse impact on human health. Due to the growing awareness about the adverse impact of synthetic fertilizers, preference for biofertilizers is projected to remain low. However, increasing dependence of fertilizer additives on the production of synthetic fertilizers is projected to inhibit the market growth. Key players in the market include Clariant Mining Solutions (Switzerland), KAO Corporation (Japan), Novochem Group (Netherlands), and ArrMaz (US). Other players such as Filtra Catalysts & Chemicals Ltd. (India), Amit Trading LTD. (Israel), Chemipol (Spain), Michelman (US), Tolsa Group (Spain), and Forbon Technology (China). These players are increasingly undertaking expansions and acquisitions to expand their market reach and increase product line. 12.5 Filtra Catalysts & Chemicals Ltd.